Who do you think Sardonyx is going to be?? I predict that Sardonyx fusion that involves Jasper and Peridot. Like Peridot, Sardonyx is a birthstone for August. Unlike Jasper, there is a precedent for such a fusion: Alexandrite. Alexandrite is a birthstone for June. Another June birthstone makes up part of her: Pearl. Amusingly enough, Pearl and Peridot are the main birthstones for their months (June and August respectively), while Alexandrite and Sardonyx are lesser known birthstones for their months. What if Sardonyx is a successful cluster fusion? That was an alternative theory I thought about after making my previous post, and probably is more a more realistic scenario than what I had initially proposed. Peridot "got what she needed" back in Keeping it Together, which presumably relates to a successful cluster. I wouldn't be surprised in the slightest if Sardonyx was either what I suggested earlier or if she were a more successful cluster fusion. I mean I want to think it's a Peridot x Jasper fusion but if Malachite unfuses, would she really want to fuse again? I've also seen theory that it could be a healed gem. I'm not sure which way to lean yet. 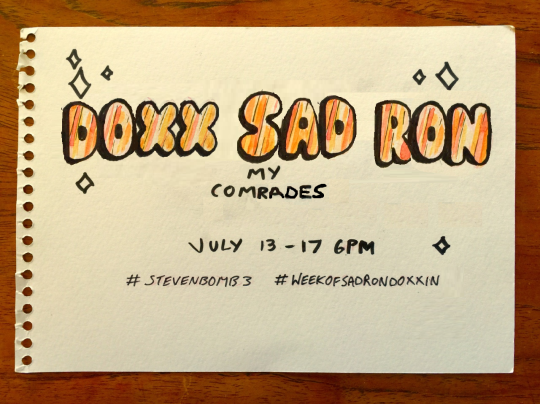 I keep pondering over "week of sardonyx". It can't be something minor if it's "week of sardonyx". It could be a new good guy, like a healed corrupt gem, it could be a fusion, or a new Homrworld gem. Exactly why I find it less realistic than Sardonyx being a successful cluster. Jasper has a low view on fusion, and from what we've seen, Peridot probably agrees with Jasper on fusion. A successful cluster could be a major event, honestly. I'm probably betting on that, as I'd imagine a successful cluster being hellish to fight. Peridot did take some clusters home with her, so it'll be inevitable that we see the cluster's projection. A theory I've heard is that Sardonyx is Jasper's boss. Another theory I've heard is that Sardonyx is Jasper's real name (because Jasper looks more like a Sardonyx than a Jasper). A theory I have yet to hear is that Sardonyx is that we could meet her at the beginning of the week, but then we see how gem corruption works, and Sardonyx gets corrupted after we get attached to her. I also keep hearing people insist that Jasper is a forced fusion and when Malachite splits, Jasper will too. I really don't know why people think Jasper is a fusion when she openly thinks fusion is stupid. It could possibly be Jasper's real name. It could also be a corrupt gem gone good OR just a new gem entirely - good or bad is to be seen. 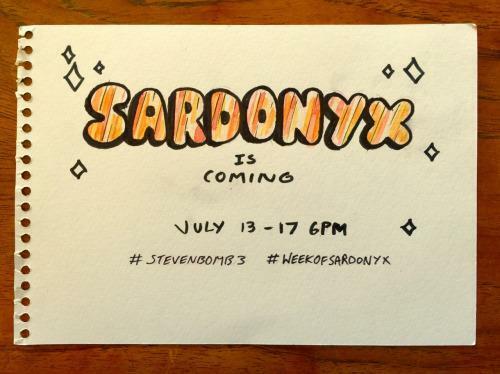 But it could be this because it is "week of sardonyx". So it's gotta be major. I think the "week" of sardonyx alludes to it being a new character because if you think of how much the show touches on fusions and such in the past, they usually only show up for 1 episode and then disappear for a while. The only fusions we've seen more than once are Opal and I think Stevonnie, and now Malachite in Chille Tid. But if it's a new character that ends up staying with the Crystal Gems for some reason then that would be a plot-savvy way to have a whole week of them without screwing up their contingency of showing fusions rarely. Cause I agree with you guys, Jasper and maybe most Homeworld gems don't like to use fusion often and I'm not inclined to believe Jasper would be willing to jump into another fusion right after coming out of one. Being that close to another gem for a long period of time I imagine would freak her out, considering her personality. I think the week of serdonyx will somewhat relat to the last steven bomb (why leave it on such a cliff hanger). the two topic in it were pearl being in love with rose (which was to just shut the people who think she didnt up in my opinion) and Fusion. I think Sardonyx will be a entily new fusion. I think it'll be a perma fuse with new characters (why give it its own week otherwise?) I think we'll be introduces to either Sard or Onyx (which are gemstones i did a tad bit of research on just for you guys) and Steven has to help them find the other. Let me make a short theory real quick on what i think their personalities (should i be right) will be like. Sard: the gemstone is meant to attract love and good fortune. it also relates to protection and courage. and here's a kicker, help with bad DREAMS and POISONS (malachite beings a TOXIC relationship). So maybe Steven will meet sard who will help with Malachite and reaveal she's been sepearted from onyx? Onyx: specificly white onyx since you need that to create Sardonyx. It's sad to ward off evil and evil thoughts and helps release others from worries and pains *cough*jasper*cough*. Maybe Onxy will be introduced on like Wednesday in the week? Where she meets Sard again and they form sardonyx? I dunno theres not much on white onyx's so i tried look at onyc in general for this next theory part about her. Onyx grounding, healing, and balancing stone, it helps banish bad thoughts and relaxes people. So his mixed with the white onyx stuff means Onyx will probs realate to malachites healing in a way. Sardonyx: Boosts Optimism, Confidence and mental discipline. It's said to bring long lasting partnerships and prevent misfortune. often associated with life fortune, luck and joyful life. After researching and bringign together soem of the common themes of sardonyx's meanings i can say sardonyx will most likely be a fusion (be it of Sard and Onyx or not), many sites i visted talks about it beign used to help make relationships last. I think SardOnyx will ultimitly be a teacher for steven and help him get hsi confidence up when he needs it most. She'll likely be an upbeat and joyus character who'll help steven save Lapis from her Malachite prison. Peridot is the exact opposite of what the peridot stone means, as is Jasper. So, in Rebecca Sugar's world of gems, they don't have to always align with what they mean in our world. So. This may not necessarily be the case. It very well could be! It could be a Ruby and Sapphire situation - however, I'm hesitant to think it is. Your theory is fun either way! ^^ Can't wait to see you draw and colour her out! Well from what I understand Doxx means to expose someone's true identity and sadly that is all I know...the others I can not seem to find. Is that legitimate or fan made? Yeah, upon closer examination, it's just a fan made image out of Sardonyx. It doesn't even make sense if I'm honest so don't worry! Oh thank god, it was getting annoying trying to figure it out XP. Good thing we have people like you. the letters they used in doxx sad ron look identical to Sardonyx just moved around, closer looks at the background help this to be evident. Rades in comrades is shaky and doesnt match the hand writing style. and the crew would've continued to use the same hashtag. So i'm thinking a fan made the second one and is just referencing some scifi thing. sorry to scare everyone. I've recently gone (back onto) twitter and followed the crew, so if theres any knews i'll hear about it and alert you guys as soon as i see it! What if Sardonyx is Centipeetle healed? I thought at first since sardonyx can be the color green but on the teaser thing the colors are orange ish. But Steven Universe has surprised us a lot so we can only wait XP.